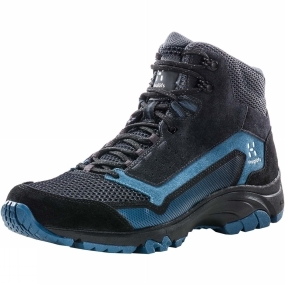 The Mens Skuta Mid Boot from Haglof is a supportive and tough trekking shoe that doesn't compromise on breathability, making it suitable for warmer climates. Open mesh in the design adds ventilation and reduces weight, and the design gives a generous, wide foot fit. A mid-cut silhouette adds stability in rough terrain. This is a must-have for the modern hiker.